I’ve been wanting to play with superhydrophobic (“very water hating”) surfaces for a couple years now, but haven’t found a source. Here’s a fun video done at CalTech. I often get requests for information about techniques. Here is the “stock reply” that I have been using to save me some time. Now I can just point people to this post! I don’t use special cameras or lenses, really. I am currently using a Canon 5D and a 180mm macro lens, but other equipment works, too. I use fairly typical high-speed photography techniques. I leave the shutter open for a relatively long time (in a darkened room) and use a flash to illuminate the splash. The flash needs to be of a fairly short duration to stop the motion well. I use something like a 50 microsecond flash. 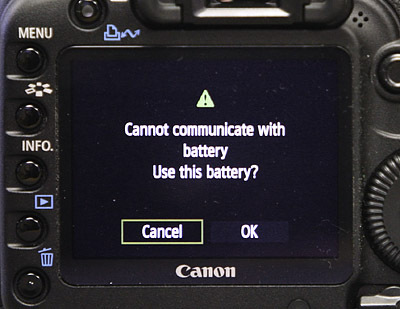 “Speedlite” flashes (as opposed to studio strobes), control the amount light output by varying the flash duration. Not surprisingly, the shorter the duration, the less light (many studio strobes are the opposite!). 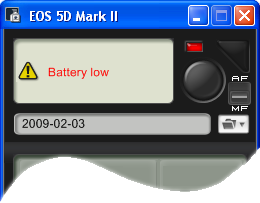 So, you can get a short duration by setting the flash for low power (1/16 or 1/64). 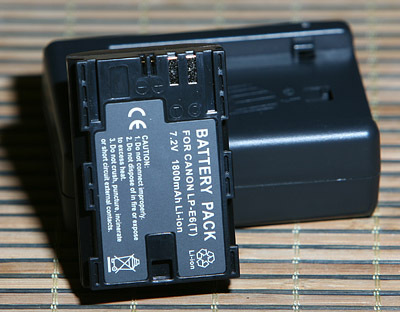 I get this by modifying the photo sensor circuit on Vivitar 285HV flash (a bit more detail) . Timing the flash is done with a photogate and electronic timer. www.hiviz.com has techniques, equipment diagrams, and kits. I have built my own timing and triggering devices (a few different ones, as I learned how to do it better.) My advice is: if you want an electronics project that will take a lot of your time (unless you’re already an EE), then design and build your own. If you want to take pictures instead, purchase the equipment. Here are some vendor choices: www.bmumford.com, www.woodselec.com, www.universaltimer.com, and www.cognisys-inc.com. And Make magazine has a kit: www.makezine.com/flashkit and www.quaketronics.com/flashkit. It’s hard to give a single formula for lighting, since different situations lend themselves to different approaches, however, using an on-camera flash is not an arrangement that I prefer, especially for the clear liquids. Rather, I use remote flashes in various locations. In the end, lighting these shots is no different from any other similar material. The only difference is that I use a flash with a short duration to stop the motion. So, for clear liquids I use the same techniques as I would for glass, since they behave optically much the same. For an opaque liquid, like milk, I light it as I would for a white bowl (except smaller, of course.) A good book on lighting is “Light: Science and Magic”. You will wrestle with depth of field issues. There are a few things you can do to help, but they all have their downsides. The photography is in many ways the easier part of what I do. Handling the fluids is what takes the creativity and patience. I have developed a fairly complex system of computer programs and hardware and mechanics that I use to create drops and do the timing. Still, I take a lot pictures and make a lot of mistakes. I have a post that goes into more detail on this, too. A simple setup is described in www.dpchallenge.com. 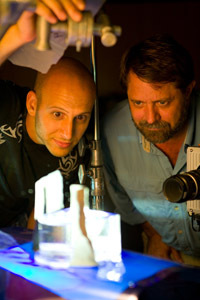 Andrew Davidhazy, at the Rochester Institute of Technology, has good information on high-speed techniques, as well as other fascinating types of photography. Fotoopa.com has some creative techniques. Harold “Doc” Edgerton, of course, is the father of the xenon flash tube and high-speed photography. Search for his books on Amazon.com. Andrew Davidhazy just pointed me to this kit for high-speed photography. It looks like a great way to get started for not a lot of money. The heart of the device is a microcontroller, so it has few parts and is extensible for the experimenter. It has both a sound sensor and a light sensor. The timing is not crystal-based, so it probably has only a 1% accuracy (I haven’t tested it so I don’t know this.) And it comes with a flash. For $125 it’s not a bad way to get started. It has the highest surface tension of any liquid except mercury. It has one of the highest heat capacities of all materials. It expands (floats) when it freezes. It is a nearly universal solvent. For my work with water drop photography, the surface tension is the most important of these, since when the volume of water is small, surface tension is by far the strongest force at work. This force is responsible for the marvelous splashes that are possible. For example, when a drop splashes and forms a column, the diameter of that column is largely determined by the surface tension: the higher the tension, the larger diameter of the column, all other things being equal. Put a bit of soap in the water, and the column is quite thin and tall. Also, when the column falls back down, it “falls” 5 times faster than gravity would have it fall, because it is the surface tension pulling it downwards. 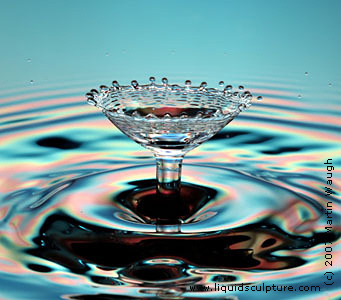 The other property of water that is important in determining the shape of water drop splashes is the viscosity. Water has a fairly low viscosity, especially warm water (I have to admit that I didn’t realize how much less viscous boiling water is that cold water – about 1/6 as viscous. When I learned this it made sense why I much more often splash hot water on myself – it really is splashier.) Sometimes I add glycerin to the water I use to increase its viscosity. It makes for a smoother, slower flowing liquid. Here is a fascinating, old device: Lord Kelvin’s water drop static electricity generator. Here is a physics class demonstration of it. Do my drops suffer from this distortion? Well, I don’t have such a generator built (yet), so I don’t have just this effect going on. But, I do believe that I see the shape of drops changing in response to static charge. I need to do some more experiments with this. 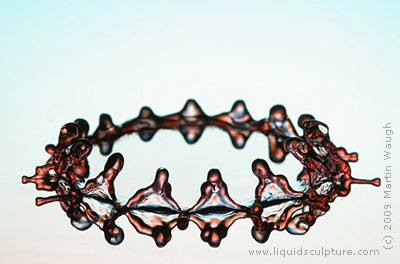 When people think of high-speed photography, the name that most often comes to mind is Harold “Doc” Edgerton. And rightly so, as he contributed so much to the discipline. However, in 1876, A. M. Worthington wrote a paper entitled “A Second Paper on The Forms Assumed by Drops of Liquids falling vertically on a Horizontal Plate”; in 1908, he published a book, “A Study of Splashes,” which contained 300 photographs and drawings to supplement his narrative. He captured those images using high-speed photography. Doc was but five years old at the time. 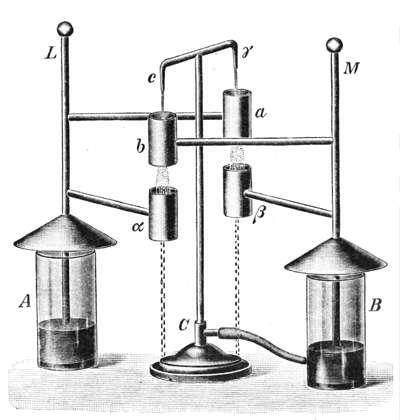 He created a short burst of light with an open-air spark gap powered by Leyden jars (it was Doc that put inert gases and modern capacitors to work). The flash was triggered by an iron ball falling onto a pair of contacts. He timed the flash by having two identical mechanisms: one for dropping the iron ball, and one for dropping the droplet of water. By adjusting the heights of the two mechanisms, he could quite accurately determine the timing. The dropping mechanism consisted of a spoon mounted horizontally on a pivot. It was spring-loaded and held horizontal by an electromagnet. When the electromagnet was de-energized, the spoon snapped downward, accelerating rather faster than gravity, and whatever was held in the bowl of the spoon had no place to go but down. The two electromagnets were driven by the same circuit, so they de-energized simultaneously. He could create a drop of a predetermined size by adding as much water to the spoon as he wanted. The only tricky part was that the surface tension of the water caused the droplet to stick to the spoon. This was solved by coating the spoon’s inner surface with lamp-black – he simply held it over a candle for a bit. The powdered carbon surface supported the water without adhering to it. You can see the remnants of the soot in some of his photos. As I consider the amount of compute power I use in my studio, I am humbled by what a clever man did a hundred and twenty years ago.